At what point would you give up? I think that all of us have a point when we would throw in the towel. When Cha Sa-Soon finally passed her diving test in South Korea it was quite a big deal! To understand just how big you have to know that she failed 949 times. In the process of taking the test that many times she spent $4200. That is quite an achievement. The back story of this 68-year-old woman is that she had a sales business going door to door. She thought it would be easier if she owned a car so she began her four-year odyssey of testing. Understand that she didn’t need to get a perfect score. The 950th time she took the test she managed to finally get a 60% passing score. I don’t know that I would want her behind me on the road, but I have to say she never gave up. I’m sure there were some who mocked her. Some who said, at least under their breath, she’ll never make it. Our text for this first Sunday in the Advent season is one of encouragement. Do you ever feel like giving up? Paul wrote to the Thessalonian Christians to encourage them in their faith and to remind them that Jesus was still coming. As we begin our journey to the manger we prepare ourselves spiritually by looking at our lives and seeing how we look compared to the withering mirror of God’s holy Law. Can we stand before him? The answer is no. None of us are good enough on our own to approach the heavenly throne or the stable housing our infant Lord. The truth is we are still acceptable to God because he makes us acceptable. He promises that his sacrifice on the cross is enough to cover all of our sins. This Advent season he invites us to grow closer to him. Are you interested? 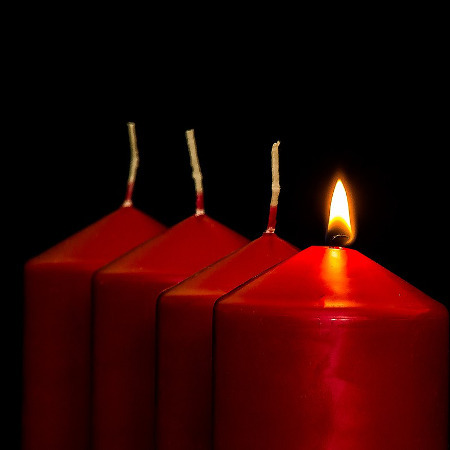 Check out the C18 Advent devotions this month. They can help you refocus your life when things get busy. No matter how crazy (or crazy bad) your life becomes, God will never give up on you. Want to hear more, including what a land mine sniffing rat is good for, check out this weeks message taken from 1 Thessalonians 3.